Fact: On August 6 and 9, 1945, the United States dropped a pair of atomic bombs—each with the force of 10 million tons of dynamite—on the Japanese cities of Hiroshima and Nagasaki, killing at least 130,000 civilians but also abruptly ending the war and its daily body count. It was a morally questionable decision then, when the U.S. was racing a team of German scientists to become the first nation to develop a nuclear weapon that would guarantee victory, and it remains so many years later. 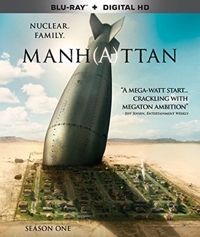 Fact: Under the direction of Major General Leslie Groves and physicist J. Robert Oppenhemer, the Manhattan Project had components scattered across the U.S., but its main facility was located at Los Alamos National Laboratory in a remote part of New Mexico, where top minds were recruited to work on the design and construction of the bombs. Fact: Because it was top secret, Los Alamos was never referred to by name, only as “Site Y” or “the Hill.” Recruits and their families went there with only a post office box to guide them and found a primitive, heavily restricted community of Quonset huts and wood frame buildings. The birth certificates of children born there list only P.O. Box 1663 as their place of birth. Fiction: Manh(a)ttan, an original WGN period drama, has a Mad Men vibe to it, not only because it drops you so believably into a different era, but also because of its similar use of music and camera angles, its emphasis on old guard vs. new, and a cast of characters that all seem to face moral dilemmas. It also has a West Wing feel because of the high stakes, crisp dialogue, and scenic constructions that somehow manage to squeeze tension out of seemingly “normal” conversations. Director Thomas Schlamme is a veteran of The West Wing, and Manhattan is just as strong of a series. 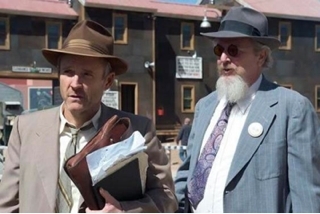 We don’t know if it’s fact or fiction that the Army created a competition at Los Alamos between a better funded “A” team of scientists under the direction of Dr. Reed Akley (David Harbour) and a “B” team run by the maverick Dr. Frank Winter (John Benjamin Hickey). But we don’t care, because the situation itself is rooted in history and it’s believable, given the urgency of the situation and the U.S. Government’s practice of making sure that no one knows more than what their compartmentalized section is working on. Loose lips sink ships. And atomic bomb projects.